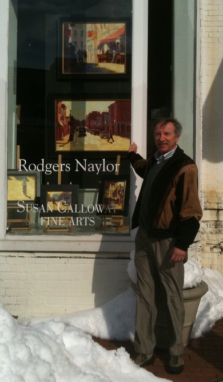 Rodgers Naylor’s DC Art Reception—at Last! Feb 19th! We drove 2 long days covering 1,750 miles to get to the DC metro from Colorado, and were blessed with no snowfall during the entire journey. We have been in Washington, DC for almost 3 weeks and arrived shortly before the two major snowfalls that have hit the area this year. We had planned to stay here for 3 weeks, but we didn’t expect Rodgers’ art opening reception would be postponed two times due to snow! Rodgers often markets his art at outdoor art shows, and we expect to be at the mercy of the weather then! I am so inspired by Rodgers, who is now in his third career! He started as a geologist, and then ran the contacts group for a major corporation. By the late 1990s, he was focused on developing his skill as a fine artist. He tried several forms of art, including various forms of print making, linocuts, water color and oil pastels before choosing oil paint as his favored medium a few years ago. He paints almost every day for most of the day, and has an incredible passion for painting. I am so impressed that he had the confidence to try something that was so different from anything he had ever done before—and that he has developed his skill as a successful fine artist who is now represented by galleries! 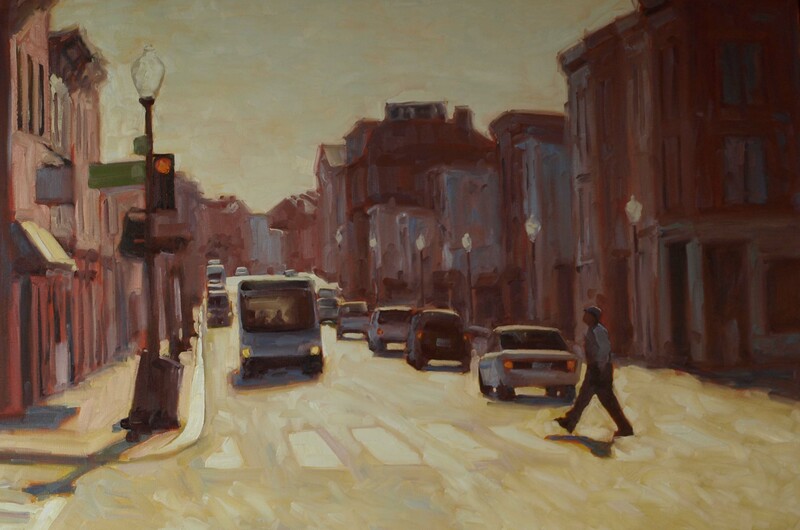 On Friday, Feb. 19, he will be the featured artist at the opening reception at Susan Calloway Fine Art Gallery at 1643 Wisonsin Avenue, NW, in the Georgetown area of Washington, DC. His art will be displayed on the second floor of the gallery, in the display window and on the stairwell leading upstairs. The reception will be at 6-8 p.m. although wink, wink we’ll be there at 5 p.m. On Saturday, Feb. 20, Rodgers will do an art demo from Noon – 3 p.m. I will be with him at both events. It’s hard for me not to seek and develop my passion in life since I am so happily married to Rodgers, whose love and energy around his art passion is infectious. As you can see his art resembles Impressionism and he has a great talent for depicting light and shadow in his work. 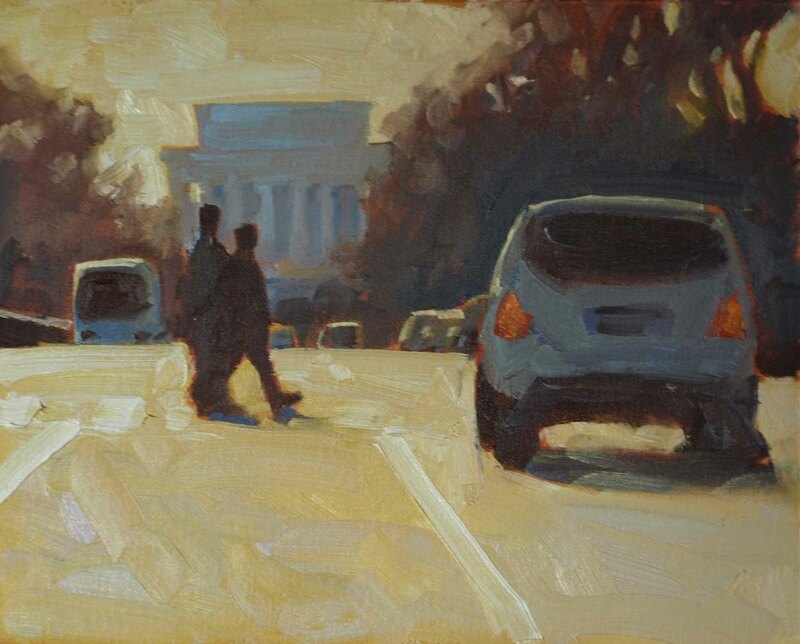 Funny – I live in D.C. and have lately been searching online for artwork depicting the city — found a link to a great impressionist-type painting of a street view of what appears to be the Lincoln Memorial. Terrific! My city in great art! Lo and behold there is an actual artist who paints my city well. I will now do a further search on Rogers Naylor to find out what else he has done. Great stuff! And a nice blog. 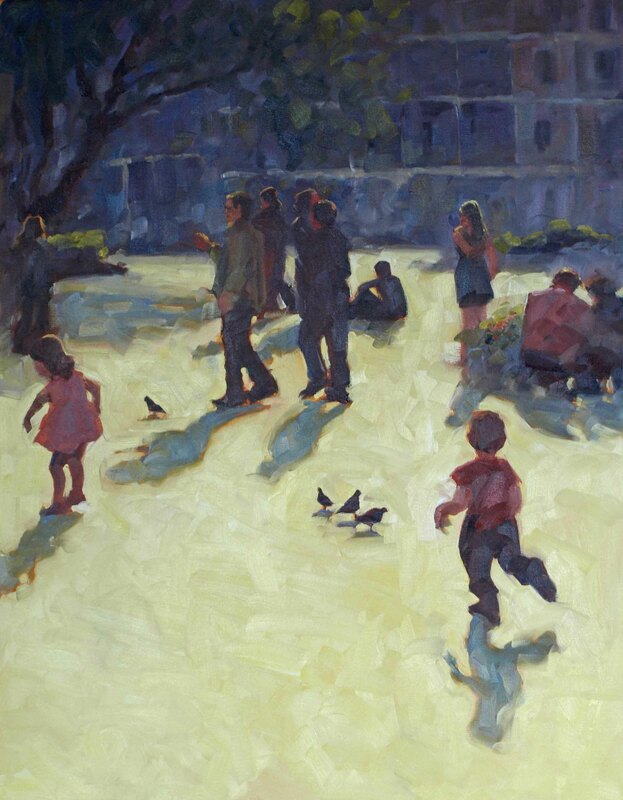 That painting might have sold, but check out Susan Calloway Fine Art for other paintings. She is in Georgetown on Wisconsin Ave, not far from the intersection with R Street. I think he has about 30 paintings there although not all of them are hung. So ask, if you visit the gallery. They are very friendly there and it’s air conditioned….Rodgers also has a cyber gallery on his website http://www.grnaylor.com. Hello Rodgers! We met at the Uptown show and I cannot wait to exhibit your work in my gallery…Grand Legacy Gallery in Rochester, MN.!!! I wish you well with the few remaining outdoor shows left this season and will me talking to you. Such quality painting with use of light!